Spinelli’s is a small, Italian market in Denver, Colorado which is curated for the family that shops daily for their meals. 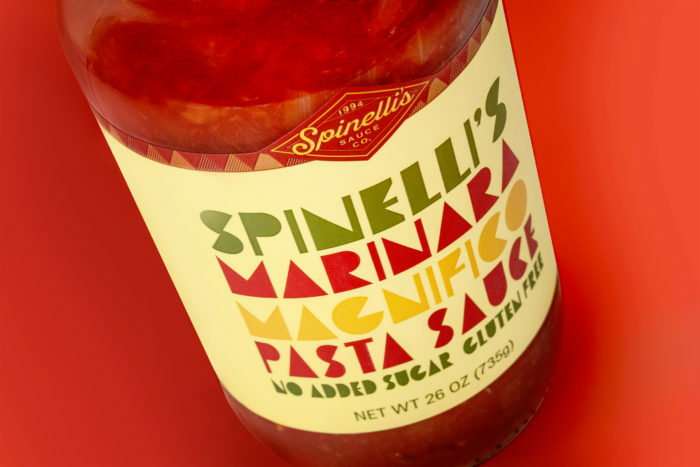 The founders of Spinelli’s Market were their own target market, as finely crafted food was important to them. 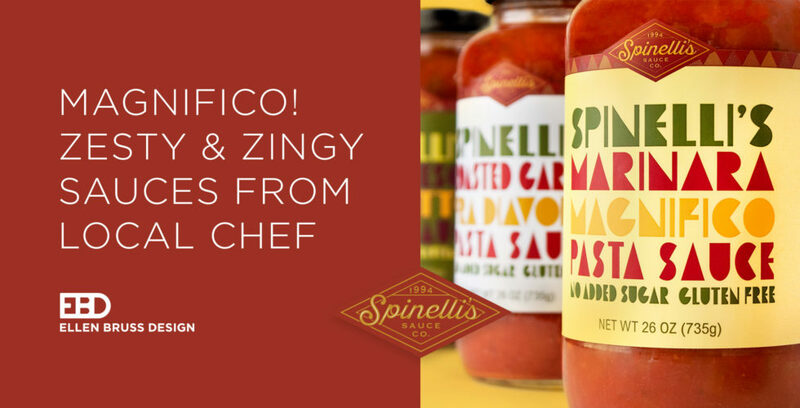 So, when Chef Chris Rogers started at Spinelli’s, she shared her personal recipes with the owners and together they created a private label line of signature pasta sauces and salad dressings called Spinelli’s Sauce Co. 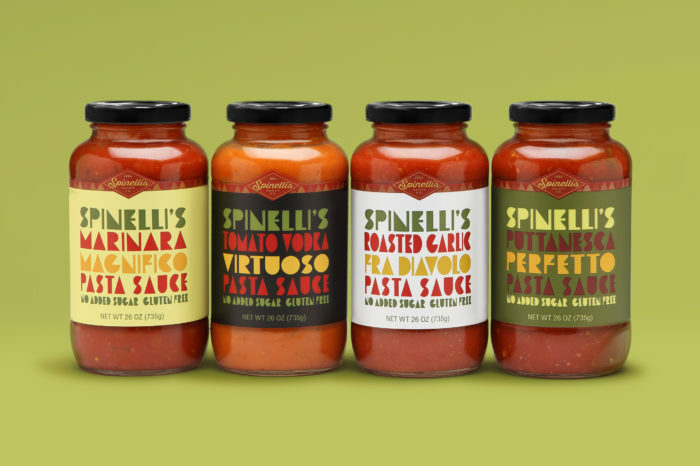 The Spinelli’s family sold the market in 2016, but the sauce company continued to grow. Fast forward to 2018, hundreds of thousands of bottles later, the sauces could be found across the state, but Chris was at a crossroads. Her label still featured an image of the family market and although it started there, it didn’t feel relevant anymore. And the food industry had changed. A product no longer sold just because it was good, it needed to also tell a story. The Boomer audience started the trend of wanting a product to clearly identify if it was made of fresh ingredients, but the GenXers and Millennials solidified it–products won’t sell without a discerning brand that defines who it is and what it’s made of. Chris realized she had to rebrand. Enter EBD. With 10 years’ experience and hundreds of products in the consumer-packaged goods (CPG) space, a meeting of the minds was the next logical step. 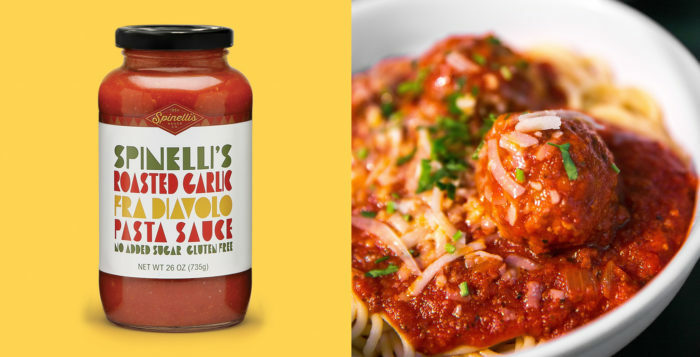 We came to understand that Spinelli’s Sauce Co. was no ordinary product – Chris only uses the best, freshest quality ingredients such as vine-ripened tomatoes, onion, garlic and extra virgin olive oil with little to no added sugar. We took a close look at the pasta sauce and cold dressing aisles and concluded most pasta products used familiar Italian colors and imagery of tomatoes. After our competitive research and an EBD staff pasta party for inspiration, we put pen to paper and hand to mouse. We knew we could create something unique. We dialed up the tried and true Italian colors and added a palette of deeper reds, a loud yellow, white, and shades of greens to help the product stand out on the shelf. Since this was our third and least safe brand design option, we said, “It’s real cool. But can mom read it?” So, we did the “mom test”, and mom after mom was able to read the labels. And as it turned out, our client loved this option as well. It spoke to her about being as daring as she’d been in developing her products. Chris is a genuine Colorado success story and continues to build her dream by adding a new sauce, which will be in stores soon. 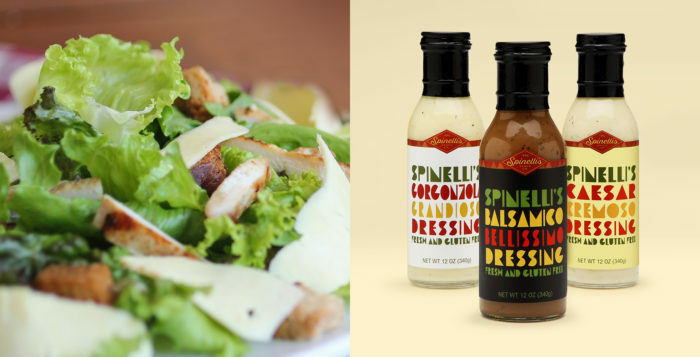 You can find Spinelli’s sauces and dressings at Whole Foods, Marczyk Fine Foods, Natural Grocers, Sprouts, City Market, King Soopers, Safeway, and, of course, the original Spinelli’s Market.